Welcome to episode four of The CUInsight Experience podcast. Hosted by Randy Smith, co-founder and publisher of CUInsight.com. In each episode we have wide ranging conversations with thought leaders from around the credit union community. What issues are facing credit unions? What are they working on to help? What leadership lessons and life hacks have they learned along the way? What’s the greatest album of all time? These questions and more will be asked and answered. Our guest today is Jill Nowacki (@jillnow). Jill is the president and CEO of the Credit Union League of Connecticut (CULCT), a statewide non-profit trade association serving credit unions throughout Connecticut. In her current role, she champions an environment that helps credit unions succeed as the best financial partner for consumers. Since joining the industry in 2001, Jill has also worked in communication and advocacy for Montana’s Credit Unions (MCUN); for CUNA as Executive Director of Credit Union House; and as VP-Development at Maps Credit Union in Salem, Oregon, where she was also the founding Executive Director of the Maps Community Foundation. Read more about Jill and find her writing here and on Medium. In this episode we discuss whole human integration, balanced teams and how credit unions can impact members and their communities. And as always we wrap up this episode getting to learn more about Jill’s leadership style, life hacks and what life looks like outside of the office. Listen to the full episode or scroll down past the short video and show notes to read the full transcript. Enjoy. Randy Smith: Hello boys and girls of credit union land. Welcome to the fourth episode of The CUInsight Experience. My name is Randy Smith. 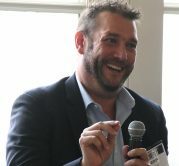 I am one of the co-founders and publisher of CUInsight.com, and it is my job on the show to have conversations with the best and the brightest of the credit union community. I get to pick their brains and find a few nuggets that we can all learn from. I must start by saying that my guest on this episode is my favorite guest, my favorite contributor, my favorite person in the credit union community and my human. Nothing against Jim, Gigi, and Dan, but she is my human and my partner so they just can’t compete. Ms. Jill. Nowacki is the president and CEO of the Credit Union League of Connecticut. Instead of doing this interview at our dining room table or the island in our kitchen, we decided to record it in Key West after Jill had finished a talk to credit union CEOs on diversity. Randy Smith: I knew that Jill and I would have a blast on this. Many of the things we talk about in this episode are conversations that we’ve had at home. One of her answers caught me completely off guard. I’m sure you’ll be able to notice when you hear my reaction to it, so listen through for that one. It’s a lot of fun. I know Jill will be a regular on The CUInsight Experience. She is one of the most thoughtful, kind and intelligent people I know. I am one lucky dude. We talked about whole human integration at work. We talked about diversity in leadership, expanding the economic capacity of communities and people in those communities and much, much more so. Without further ado, I give you my conversation with Ms. Jill Nowacki. Randy Smith: Jill, welcome to the podcast. Thank you for joining us today. Jill Nowacki: I’m excited to be here. Randy Smith: Thank you for allowing me to do this while we’re on vacation in Key West. Let’s just jump right into the questions. Something you and I have talked about a lot, whole human integration at work. You wrote an article on it. Being human is not a liability that was published on CUInsight, we will link to that in the show notes below. Will you explain what whole human integration is to our listeners? Jill Nowacki: Whole human integration is something that I thought about as I was looking more and more the use of artificial intelligence and workplace and particularly how credit unions are starting to automate a lot of their processes. It came to this idea that in order to get the most out of the data we have and the processes we have in place, we also need to have humans that can take care of that and the skills that humans bring to the table are incredibly different than what we can now automate. The other part that goes along to that though is making sure we recognize that what is human about our employees is what differentiates them from the robots and that those strikes need to be acknowledged and integrated and worked with in the workplace. So when we have people coming to work who are also parents and hobbyists and do things outside of work, in addition to being employees, we have to recognize that and give them the room to be humans while at work. Randy Smith: That is true. We’ve talked about that quite a bit. Do you think that’s even more important than the hyper competitive recruiting environment and work environment? Jill Nowacki: Absolutely, and I think that’s the reason why we need to. We’re not in the industrial revolution anymore. I think we may be on the cusp of a different type of employment revolution. I don’t know what it would be called but we are definitely in a situation where employees have the opportunity, people have the opportunity to craft their lives much more how they want to through, the example I cite the most is if you could be a teller for $15 an hour, who’s on a super strict schedule or you could go drive Uber and do it when you want to and change your hours when your kids are sick, you’re absolutely going to choose the one that gives you the flexibility and the trust and the ability to set your own hours and right now the way credit unions, employee tellers, frontline staff, that flexibility isn’t there in most cases. So I do think we’ll see some changes with that and I think credit unions are going to need to figure it out if they want to be able to keep employing people in this role. Randy Smith: Over the summer when you were laid up from foot surgery, you actually, quite a bit, you’ve told me the story of the guy who worked for Pepsico and he was basically making more money driving the Uber part time. It’s interesting. Can you give any examples of whole human integration in action or credit unions specifically doing a good job of this? Jill Nowacki: So you’ve told me a lot about reading the book, Let My People Go Surfing, which is from the Patagonia CEO, founder. That’s a great example of a company that is living their values consistently across all channels, so in addition to I think many people probably saw recently, they got their tax refund back and ended up donating it all to cause to protect the environment, I think, which is consistent with what they do. In addition to that though, it sounds like they flex their workdays and their employees’ hours to let them go out and enjoy what the brand stands for as far as outside. Randy Smith: To let their people go surfing. Jill Nowacki: I’ll have to read the book. Randy Smith: To switch gears a little bit. Something else I know you’re deeply passionate about is expanding the economic capacity of communities and people. What does meaningful community development in member development look like to you? Jill Nowacki: So yes, I am firmly believing that credit unions, primary role is to expand the economic capacity of the individuals and the communities that they serve. And what that means to me is that when credit unions are looking at writing new programs or products or services or engaging with their community, it’s not about just writing a sponsorship check for the local little league team, it’s about trying to make an investment into that community that pays forward. So it’s increased access to affordable capital. It’s providing match savings programs that get people to receive their next level education where they can go out and get jobs where they make more money. So it’s the investments in opportunities in areas that allow the people in the community to do more themselves as well. To me, that’s what the meaningful community engagement looks like or meaningful community interaction looks like. It’s being able to connect with others, whether it’s the members themselves or the community organizations in order to help build the communities complete capacity for economic well being greater. Randy Smith: I think you just kind of answered this, but is there a difference between the community development and the member development? Jill Nowacki: I think it can tie together really well, but when I think about member development, I think about the products and services that the credit union actually builds. When I think about the community development, I think more about what may happen in the broader community, so if you have a community where affordable housing is a really big issue, you may work with individuals on providing counseling or down payment savings assistance programs, but then you work with other organizations in the community that are addressing that problem as well. So maybe the community outreaches and connecting with a local housing agency and maybe there’s even a third kind of more for profit arm where you’re beginning to fund lending programs for developers to put more local housing a place too. So it’s kind of an all encompassing way where you start with the community problem that’s there and then work towards solving that in order to make the community a healthier place. Randy Smith: On a previous show, I read the report that Gigi Hyland wrote talking about credit unions and the healthcare system offering whole health programs. Would that be a community development program? Jill Nowacki: Absolutely, and obviously Gigi is the expert on that. I’m more familiar with the idea of how education and poverty can link together, but I think what Gigi has found in her report, and she’s clearly the expert on it, but I think what she found is there’s a really clear link between poor financial health and poor overall physical health with people too, and so one of the findings in that that was really surprising to me is that if you’re living in poverty or living kind of on the margin, you won’t go get preventative healthcare and if that’s the case then things get worse and end up costing far more. Or if you can’t make ends meat, you don’t pay for health insurance and then when a problem arises, you don’t have health insurance to cover that. So absolutely. I think there’s a connection. I think there’s also a connection with the ability to access things that contribute to healthy living conditions, so access to fresh fruits and vegetables, living in an environment that can be appropriately climate controlled for what’s going on outside. Like having air conditioning or heat and living in places that don’t have mold in them that don’t create like asthma and little children too. Randy Smith: So that’s the community side. Is this something that you see starting an individual credit unions or is it systematic? Jill Nowacki: I think individual credit unions can and should do it with the communities they serve and I think as far as system wide, I do think it should be a bigger part of the conversations we’re having. Randy Smith: Do you think this is an area that we’re dropping the ball a little bit? Not to call anybody out. Jill Nowacki: As a system, I don’t think that that has quite moved to a point yet where it’s become prominent and a major area focus, as an example, I think this is the type of thing they have a breakout session for, not a keynote session and so I think that it would be interesting to see us move towards that and I think it would be an excellent way for credit unions to really differentiate from other financial services providers that are out there. Randy Smith: Is there anybody that you want to give a shout out? Is there somebody who’s doing this well? Jill Nowacki: There are many people who are doing it well. I think that we see great examples. I know at the state level I’ve always been really impressed with and of course my career started in Montana, so it’s easy. It’s kind of my my home place in my heart is there, but what the Montana Credit Union Network has built as far as statewide opportunities for their credit unions to really engage with specifically in this case it’s a student loan program where they built a public private partnership in student lending where the credit unions were providing match savings accounts to people wanting to go to college for the first time. System wide I think we know and acknowledge that the student loan burden right now that people today hold is, is crazy and definitely crisis level and I think what they did as a state with come together and try to solve that problem with something that was meaningful and it has made a difference in Montana. Randy Smith: How can this make credit unions more relevant? Increase the longterm viability of the system? Jill Nowacki: When we take efforts that expand the economic capacity of those we serve, we create healthier members, so we have members who are more financially sound, more financially stable. We’re accessing people right now and moving them toward the next level of financial stability, so when we build a better base of members, it increases the likelihood of that financial success from the credit union too. It also can increase these feelings of ownership and loyalty that our members have that may cause them to stay with credit unions rather than go to alternative choices. Randy Smith: This is the question that I just added. What are the current beliefs held by credit unions that you think will significantly change in the foreseeable future? Jill Nowacki: I think there are two widely held beliefs right now that I reject both of them and they’re completely different. One is the idea that fintech startups are going to ruin the credit union industry. I don’t think that fintechs are something to be scared of. I think they’re an opportunity to partner with and I think they could even searve as inspiration because so often in this kind of ties into my next thought that I think is a falsely held belief for credit unions, we get so terrified that some fintech startup is going to come in and take us out of business and they’re all these little startup companies that many of them are starting in their parents basements where they’re not coming out with loads of capital. They’re coming out with great ideas and great innovation, but they don’t have scale when they launch and yet we’re terrified of them. Simultaneously. We’re also seeing, oh my gosh, if my credit union’s not $500 million, 1 billion, 10 billion in assets. We’re not relevant because we’re not big enough. So I think that’s almost a contradiction to this idea that Fintechs, they’re going to come in and be nimble and take us all over and put us all out of business, but we’re too small. We can’t thrive and be relevant and I think we could see some really cool things happen if some of our credit unions, including the small ones sort of realign their thinking and tried to be more like that fintech startup when they move forward with the programs. Randy Smith: We’ve talked about it before that we’ve seen fintechs change trying to go directly to consumers. They’re actually like we want the credit unions, we need the members? Jill Nowacki: I think when the first few people moved onto the landscape and you know, I should be careful because I think Quicken Loans, it’s like technically a fintech startup and certainly Paypal is and they’ve reached some scale, I guess. But I think a lot of the early innovators who came up with products and programs in fintech thought, oh, you know, this is gonna be amazing and I’m going to build the next paypal. And then as they got into it, they realize I have a great product. I have something that’s meaningful to a niche group of people, but I’m not going to make them the next paypal. I can make this product available through partnerships too, and I think that’s the mindset that credit unions are going to adopt more widely is that they too can get into those partnerships and make some amazing things happen. Randy Smith: Okay, so I want to switch gears a little bit. This is the leadership and lifehack part of the episode. What was it about credit unions that inspired you to take the job? As president and CEO of the Credit Union League of Connecticut? 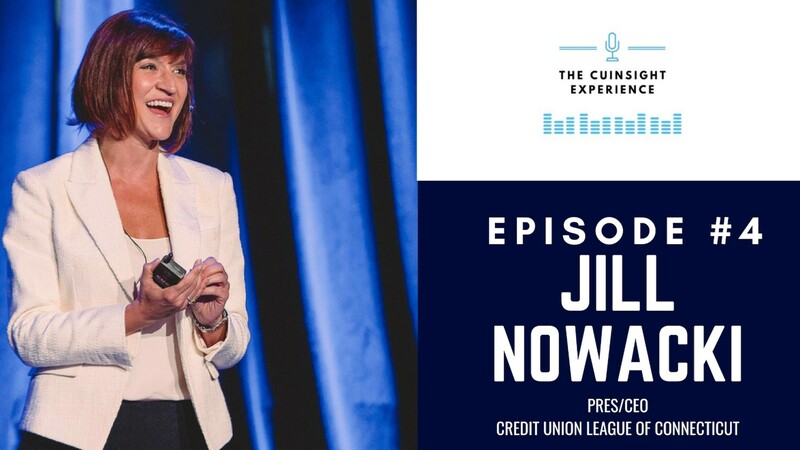 Jill Nowacki: I’m really excited about what credit unions can do for their communities and how they can serve their members and I think there’s tremendous potential at the state level for credit unions to come together with meaningful collaboration and introduce programs that can solve the economic problems in a state and so I was excited about having the chance to be able to help try to bring those credit unions together and move them forward into that place. Randy Smith: Has that inspiration changed with time on the job? Jill Nowacki: The inspiration hasn’t changed. The approach maybe has a little bit. It’s been about five years, just a little over five years, that I’ve been in Connecticut. When I started in my job interview, one of the questions they asked me was, you know, half of our credit unions are losing money right now. What are you going to do to help that? So two or three of my five years it was, it was tough. We were having tough financial performance. We were having tough member growth. The good news in Connecticut is that’s turned around a lot. We’ve seen a lot of improvements with that, but it definitely, I think thinking I was going to walk in the first day and be like new programs that ideas and everybody would be right there with me. It didn’t really work out that way. There was a lot more necessity to focus on earnings. Focus on increasing compliance burden and some of those day to day areas of focus, keep those bigger collaborations from happening and taking off. Randy Smith: Speaking of change, I’m going to stick on that for a little bit here. You mentioned Montana earlier where you got your start credit unions. How have credit unions changed since 2001 when you started in Montana? Jill Nowacki: I spent almost half my life and credit union now and to answered the question about how credit unions have changed since I started. Has me kind of stop and wonder how much credit unions changed versus how much has my perception changed and personally I’ve also changed a lot since I was 22 and the way I think has changed a bit too, so I’m not sure how much of the change has been me versus being credit unions. At that time I had a much different role too. I was doing marketing for credit union and most of what I did with producing these eight and a half by 11, two sided newsletters that credit unions would mail out with their statement inserts and we would check to see if members read them by hiding account numbers in there so that they can then call the credit union if they found their account number for an extra $5 deposit. Right about that time email marketing was starting to hit the stage and I remember being terrified that if email marketing took off I would be irrelevant and could never be employed again because my entire career experience was credit union related at age 22. So I think that I’ve seen a lot change in credit unions and my outlook as far as we can do has changed too. Randy Smith: As you know, I’m a big fan of your writing. Often you write about diversity in leadership teams, giving more people see that the table and everybody should follow you on instagram as well @seat_atthe_table. As a CEO that happens to be female, what do you see as the biggest roadblock to leadership teams basically having a look more like the general public? Jill Nowacki: So this is great because I just gave a talk on this this morning, so I have all sorts of statistics in my mind for it. Something that surprised me as I was doing research for this talk on balanced teams and I completely see it in practice and it’s this idea that 50 percent of male respondents to a survey say that a team is well balanced or women are well represented on a team if one out of 10 members are female. So that 10 percent, not 50 percent and and not actually balanced. I think that what that feeds to or what that supports is the idea that I think the biggest roadblock to gender balance is a blind spot to it. Where if we think that one out of 10 is balanced, if that’s what we see and therefore we perceive there balance, we aren’t going to try to solve that problem because we think we did it good, for us, and I think we need to identify about the blind spots are there. And then also the unconscious and conscious biases that exist in trying to move that toward a place of balance too. Randy Smith: Is there any quick tip to get the conversation going, that you want to throw out there? Jill Nowacki: Well, to get the conversation going, I just want to say don’t be afraid to have the conversation. I think the most well intended men who I talked to will say, I don’t feel like it’s my place. I’d like to help and I’d like to do something, but what do I know about being in this situation? What do I know about solving this problem? There are so many things that I could say and could suggest starting the conversation is critically important and then what research has found to be true is that the single best way to get a woman on her best career path possible is for her to be mentored by a man. So there unfortunately it has been some backlash in light of #metoo where men are actually increasingly less likely to mentor a female subordinate or colleague. And so overcoming that fear, pushing through and looking for opportunities as a male leader where you can mentor a female subordinate or colleague is a fantastic first step. Randy Smith: As a leader, is there something that your team has heard you say so many times they can finish your sentence? Jill Nowacki: I hope that what they’ve heard me say more than anything else is, thank you for all you do for Connecticut’s credit unions. 2018 has been a tough year for my team and we’ve been really lean and putting out a ton of work, so my team’s been super human in that capacity in the work thet’ve done. I hope they hear me say thank you a lot. Randy Smith: Hopefully they’re listening. Has there been a piece of advice or a life lesson that you’ve held on to and go back to often? Jill Nowacki: So when I started out at that job I was doing producing all those newsletters in Montana’s credit unions, I had a lot of ideas for how we could do different marketing. My supervisor at the time said to me, you know what I’ve realized is that every time you have a new idea it means more work for me and you’ll outgrow this enthusiasm one day, I promise. It was a bit frustrating to me and I was talking with the CEO, who’s still the CEO now, Tracey, and Tracey and I were in a conversation and I told her about some of the ideas I had and she said, well, why don’t you just go for them? And I said, well, I think the supervisor kind of wants me to be a little more cautious and be a little more hesitant and Tracey’s advice was do it anyway and let the chips fall. And so I find that even today when I end up in a situation where I sort of second guessed the new initiative I want to start or how I want to move forward and think, oh, well maybe it’s too hard. Maybe there’s not enough time. I ended up self talking myself with that. Let the chips fall. We’ll see what happens. So I go back to that a lot and I still have all that enthusiasm too. I haven’t outgrown it. Randy Smith: When you run into a wall is there something that you do to take a step back and get some different eyes on it? Jill Nowacki: So as you’re probably more than aware, I’m an analyzer. So I spend a lot of time in my own head and with my problems. Typically by the time I come across an actual problem, I’ve already figured out 30 different perspective solutions to it and I tend to fall into this trap of thinking if I could just think about it a little more i’ll come up with a solution. Recently and he’d be another great guest for your show. So Leo Ardine, who’s the CEO at United Teletech Financial in New Jersey, he came and did a session for my executive education program we put on where he did a mindfulness and emotional intelligence session for our upcoming leaders in Connecticut and he shared this visual during the session about this idea of like a brain. So visualize a root bound pot found plant, that’s potted, but in too small of the plot and the roots are all tangled up on itself and tightened up. And talked about how we don’t stop and give our brain space, that’s essentially what happens with our thoughts. I do try to keep that in mind and look for ways where I can create a little space in there, like take that pot out, let the roots stretch out a bit, and I do find that running gives me that help when I’m looking for it. Randy Smith: If you have a free day, nothing on the calendar, what passions do you have outside of credit unions? What do you do to recharge? Jill Nowacki: It’s hard because my first thought when you say if you have a free day is I’m a working mom, I don’t have a free day. I’m a big fan of this idea of work life integration, and I think that goes back a little bit to recognizing the humans that we work with and what their needs are, but I do get energy from time with my son when it’s the right kind of time. To often I think what I ended up getting into a struggle with on a regular day is going through this routine of pressuring on homework and trying to make sure everything gets done and making sure all the chores get it done and thinking, well, you know, we’ll have fun once all the work gets done. So I do try to step back from that and try to introduce other sort of activities and opportunities that can be more memorable. But I do find that for me, the way to find that time and that space is I do have to remove myself from the situation. It’s hard for me to do it when I’m at home because when I’m at home I always feel like there’s something calling me dragging me. So I do find that I’m far better when we get out of town and bring Crosby with us. Randy Smith: We do like to travel. As a leader, how do you make sure that your message stays fresh to your team? And in your position, how do you make sure that the league’s message stays fresh to credit unions? Jill Nowacki: So it’s important to have a fresh message and though I also think it’s important to you make sure that that message resonates. There’s that whole you have to hear something seven times before it hits. My bigger fear is we wouldn’t have a consistent message for long enough that that message is what resonates with people. I’m concerned that the, whether it’s my team or my credit unions or it’s my politicians that when they think Connecticut’s credit unions, they don’t think of the same kind of message consistently. So I’m really in a point where I would prefer to be coming up with that kind of easy, clear value statement and then I’ll worry about how to keep that fresh. So at this point, I think I want to make sure it lands in a way that’s meaningful. I feel like the best area so far in that is by using really personal stories. That seems to be the thing that helps people connect. It’s definitely what works with our lawmakers. When we go in and we talked to them about how there is a provision that will allow credit unions to be able to help teachers who live in multifamily housing. That’s something that they’ll remember and ask us about the next time we come in their office, in a way that saying if you could please give us one to four family lending, that’d be great. Is not as resonant at all. Randy Smith: You’ve heard me putting these together, so now you get to go through the rapid fire question. As you know, they’re rapid fire, that means the questions are, but the answers don’t have to be. Do you have any daily routines? That if you don’t do at the end of the day, you just feel off? You feel like the day was a little bit off. As you know, I journal and keep mentioning moleskin until they send us free ones, but what is it for you? Jill Nowacki: I have an ideal day for sure. It goes back a little bit to that kind of working mom, CEO thing. It doesn’t always play out how I wanted to. A perfect day would be waking up, immediately going running or doing yoga and then coming home, drinking coffee and journaling and then my son deciding to wake up after I finished doing all of those thing. That happens about never so, but that’s a great way for me to just start the day really balanced. What I find works on those days when I don’t get that in, it was just being able to say, okay, what are the three wins and have today, and then making sure those things get done so that at the end of the day I can reflect back and still feel like it was a good day. Randy Smith: The random question, and I know the one that I think you were stressing about the most, what’s the best album of all time? Jill Nowacki: Oh, I did stress about this. I’m not cool. I don’t know cool music. It’s a bummer. So music for me is probably far less about somebody who’s a musician, would they make good music. It’s really nostalgic for me and so as much as I thought I was going to answer that, it was Taylor Swift’s Reputation album. Because I was at a really happy place in my life when I played that over and over for four months and my car. But I think it’s probably Tim McGraw’s Everywhere. And the reason for that was really significant to me. It was the time when I moved from high school into college. So it’s a big life change. I was starting to feel independent and grown up and meeting my new friends who are still my good friends today. And then in 2008 it was actually also the Green Grass Grows was the song that my dad chose to play at my mom’s funeral as well. So it’s kinda had lasting staying power and nostalgia for my life too. Randy Smith: We have a stack of books in our house that’s been growing, recommended to us, other people have told us about. it’s been fun asking this question on the podcast. Is there a book that you have gifted over time that you recommend that you think everybody should read? Jill Nowacki: The Alchemist is above that I encourage people to read. Professionally though I’ve been spending a bit of time with Brene Brown and recently her newest one that I’ve read is called Dare to Lead and that one was so filled with so many just aha moments for me, particularly in the work she did around understanding what your personal values are, defined those personal values and then hold onto those two personal values and craft your life around those two values in a way that is absolutely just relentless. I actually loved that book so much that I put a challenge out to my team that if they would read the book and then if they would come up with two ideas from the book for how our team could improve how we’re serving. There was an insensitive and I loved the book so that I even put myself out there and said they came up with a third idea that was specifically related to how I personally could improve as a leader. There was an additional incentive for that. I do hope they’ll come back with some stuff because there is some great tidbits, good step to apply as leaders at work, and good steps for individuals to apply to their lives. Randy Smith: It’s a good book, you had me read it. When you hear the word success, who’s the first person that comes to mind? Jill Nowacki: Well, I have a good friend from college. Her name is Genevieve Priebe, and whenever I hear the word success I think of Genevieve and it’s because early on, shortly after my son was born and she and I met for dinner. Our lives at that time I had a pretty big job. I was a mom. I’m married. I had a house. And it kind of felt like I was racking up all the things that you’re supposed to have for success and she was going through her life and all that she was doing to you and she was actually making some big professional transitions at that point that would give her a lot more time to travel and to spend time training for ironman races and she was just changing her life a lot and as we were having this conversation, she said, as I’ve gotten older, I’ve learned that individuals have different success metrics. And so every time I found myself feeling like I’m doing things to check them off the list, it’s given me that moment to be like, is this my success metric? Or is this what I think I should be doing? And reevaluate from that perspective. Randy Smith: This ties right into that, for sure. As you’ve gotten older what’s become more important to you and what’s become less important to you? Jill Nowacki: What’s more important to me now is space. To define my time and making sure that I’m spending that time on the things that i value and that are important to me. And for me I recognize that is seeing the world. I want to go out and have the chance to be inspired by what else is out there. Where I see that importance come out the most is in like how I spend my money, for example, and so at a point five years ago, I was far more focused on what my house would look like and how that would be and now I’m far more focused on how can I use the house that’s a good base and that takes care of my needs, but that provides me with the disposable income to go out and see the world and spend time knowing what else is out there and to spend time when I’m home rather than worrying about things like lawn maintenance and housekeeping. Being able to really focus on time with the people I love. Randy Smith: Is there anything that you think of that just became much less important? Jill Nowacki: I think it’s material possessions from that perspective, so I definitely still, you know, I still have an attraction toward certain luxuries, but I think I’ve become much better at sort of taking the critical eye to examine, is this something I want because I wanted it or is this something I want because I feel like it’s what I’m supposed to want to do at this point in my life and my career. Randy Smith: So to add one more Tim Ferriss question, what advice would you give to your 25 year old self? Jill Nowacki: I wouldn’t tell the 22 year old marketer that she’d be able to keep up with the market. She figured it out. But the life advice that I would give back, life advice I would give back and I’d certainly give it to anyone who I talked to you right now is you know, defining those values, defining those two personal core values and making sure you’re really looking at it through the filter of not what you think people want you to say. Not like if your family found your list, are they going to disown you because they weren’t high enough up on it. But really what is it that drives you, and pushes you and, and lights you up everyday? Randy Smith: That is a great way to end. Thank you again so much for being on the show. Do you have any final thoughts or asks of our listeners? Jill Nowacki: Yeah, I think the final thought I would share. I just would reiterate the importance of knowing and being able to define the values that someone has. I was reading an article in the New Yorker. I actually read it so I think I should be able to keep my magazine subscription now. It was an interesting article with a professor from University of Michigan and she was talking about the way to reach social equality, economic equality, is by being able to better understand the values that are brought by different people, to different areas. And that as a society we so often look at just a very limited number of things that we consider to be high value contributions and the reality is that there are so many different ways to contribute and by us as individuals being able to recognize what our values are, the value we add to the world and by being able to look and recognize those and others too I think is really critically important. It goes back to that whole allowing the pursuit of being a whole human in life and that whole human integration. So I guess the final ask would just be too, to know those values, know what it is that lights you up as a human. The world needs that. They need more lights in it. And so that would be the ask, is do what lights you up. Randy Smith: That is the perfect way to end, do more of what lights you up. Is @jillnow on twitter. The best way to get ahold of you if people have additional questions? Jill Nowacki: @jillnow is great. My email address directly is fantastic too. I’ll take text messages, phone calls. Yeah, anything is good. You have my contact info. Randy Smith: We will link to all of that in the show notes. Again, thank you very much for being on the podcast and I hope everybody has a great day.